With South Florida’s year-round warm weather, many HOAs and communities in this area consider their patio furniture to be an essential part of their community’s club house. 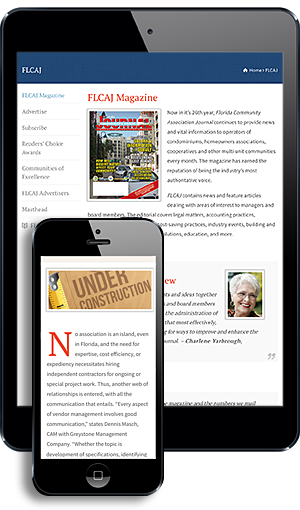 This can be particularly true for those living along the intracoastal or the ocean, which affords enviable water views. However, South Florida’s weather is hard on outdoor furniture. The sun, humidity, and—especially for properties close to the ocean—the sand and salt in the air can wreak havoc. It’s only a matter of time before that furniture shows the effects of exposure to the elements. What most property managers and HOA board members don’t know is that high-quality patio furniture can be fully restored to look and perform like new furniture. Old, weathered patio furniture can be refinished, re-strapped, or re-slung to have a showroom-like appearance. In addition to the endless possibilities of new finishes and fabrics, restoration is very cost effective, considering the prices of purchasing new, excellent quality patio furniture. Restoration can include re-finishing frames by sandblasting the old dull finish off, pretreating the furniture, and applying primer and a new decorative finish. A new powder coated finish will ensure a long-lasting finish, similar to new furniture. Other services, such as vinyl or sling replacement as well as custom cushion replacement, can update the look of old furniture to complement new modern trends. One of Absolute’s specialties is re-vitalizing quality, metal patio furniture with a high-quality powder coating that includes an epoxy primer coat and a polyester topcoat. This multi-process coating can offer superior corrosion control. Communities can choose from a wide variety of colors and textures of powder coating, as well as hundreds of colors, patterns, and fabrics of slings, straps, and cushions. Powder coated finishes come in a wide selection of upscale options similar to what is being offered by patio stores and manufacturers today. 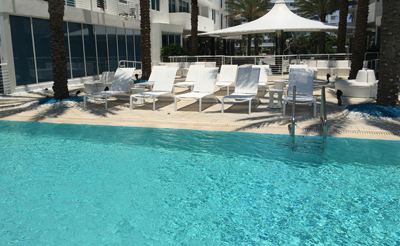 In March 2015, Jose Zelaya, property manager at The Sapphire Condominium in Fort Lauderdale, contacted Tammy Leeman at Absolute Patio Furniture Restoration and requested a quote to refinish the frames of their 30 chaise lounges as well as replace the slings for each chaise. In the years preceding this March 2015 contact, the finish had started to deteriorate, as the property is located on the intracoastal. The slings also began to stretch over time. Since the color was white on white and the furniture was worn and weathered, it was time to either replace the furniture or restore it. Tammy met Jose and several members of the board and offered a new marine-grade white finish as well as a durable commercial grade sling. The Sapphire property also added 10 aluminum trash cans to be refinished as well. If a community or HOA has excellent quality outdoor furniture that requires refinishing, vinyl strap replacement, or new slings, restoration is a great option and will save a property a great deal of money. 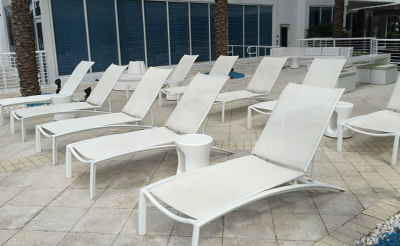 Peter Leeman is with Absolute Patio Furniture Restoration and Absolute Powder Coating located at 1254 NW 21st Street, Pompano Beach, Florida 33069. For more information, estimates can be obtained easily by emailing photos with quantities to quotes@absolutepowdercoat.com, by calling (954) 917-2715, or visiting www.absolutepowdercoat.com.